Another year, another milestone! Everyone loves to see true love flourish and grow, and what better way to celebrate than by throwing an anniversary party?! Whether you’re planning your own celebration, or you are a grateful son/daughter throwing a bash to recognize Mom and Dad, find all the help that you require for this special occasion! From an intimate celebration to a celebratory fiesta, you can rest assured that our vendors will you be with you each step of the way! Need some inspiration? Check out our anniversary video for tips on everything from theme and location, to decorations and dining. 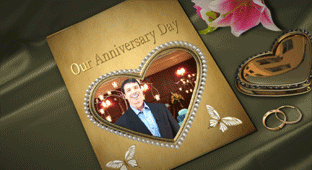 We have everything you could possible need from start to finish; Anniversary invitations, anniversary favors and supplies, even Wedding Officiants if the loving couple wish to renew their vows! Happy Anniversary! You inspire us!